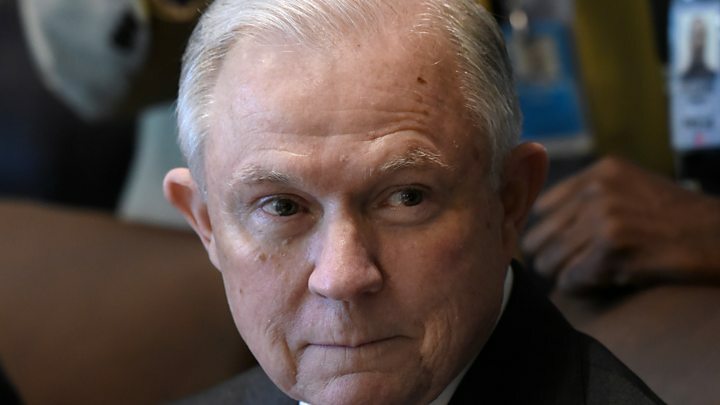 Media captionJeff Sessions: "I have recused myself in the matters that deal with the Trump campaign"
The Democrats have maintained their attacks on Mr Sessions, saying his explanation regarding his contacts with the Russian ambassador in 2016 were "simply not credible". Sergei Kislyak : Career diplomat or recruiter of spies? Mr Trump said the Democrats had "lost the election and now they have lost their grip on reality". His campaign was dogged by allegations that some of his team had met with Russian officials and that Moscow had interfered in the election on his behalf. The president has branded the allegations "fake news". How did Mr Sessions come under fire? It stems from his comments at his confirmation hearing in January. He was asked: "If there is any evidence that anyone affiliated with the Trump campaign communicated with the Russian government, in the course of this campaign, what will you do?" Mr Sessions responded: "I'm not aware of any of those activities. I have been called a surrogate at a time or two in that campaign and I did not have communications with the Russians. And I'm unable to comment on it." However, it then emerged Mr Sessions and Russian ambassador Sergei Kislyak held a private conversation in Mr Sessions' office in September and spoke at a meeting with several other envoys on the sidelines of the Republican National Convention in July. Mr Sessions was at the time a member of the Senate Armed Services Committee. But he was already a prominent member of Donald Trump's campaign team. The former Alabama senator also had meetings with more than 25 foreign ambassadors in the course of the year. What does Mr Sessions say now? He insists he did not lie at the confirmation hearing, saying his comments were "honest and correct as I understood it at the time". Image caption Donald Trump said the "real story is all of the illegal leaks of classified and other information"
He said he had spoken with the Russian ambassador as a US senator and not as Mr Trump's "surrogate". Will Jeff Sessions sink or swim? Who is Attorney General Jeff Sessions? He said: "I never had meetings with Russian operatives or Russian intermediaries about the Trump campaign." Mr Sessions admitted that in his confirmation comments he "should have slowed down and said, 'but I did meet one Russian official a couple of times'". He said that during his meeting with Mr Kislyak they talked about terrorism and then "somehow the subject of Ukraine came up". But he added: "I don't think what was said about that meeting I had with the Russian ambassador was legitimate. I think it was hyped beyond reason, and I think it was unfair." However, he has taken himself off an FBI investigation into the alleged Russian interference in the election, saying it could be "perceived that I wouldn't be objective". The Democrats are not easing up. Ms Pelosi repeated her call for Mr Sessions to quit. She said his "his narrow recusal and sorry attempt to explain away his perjury" were totally inadequate. Adam Schiff, the top Democrat on the House intelligence committee, said Mr Sessions "clearly misled" the Senate and his explanation was "simply not credible". 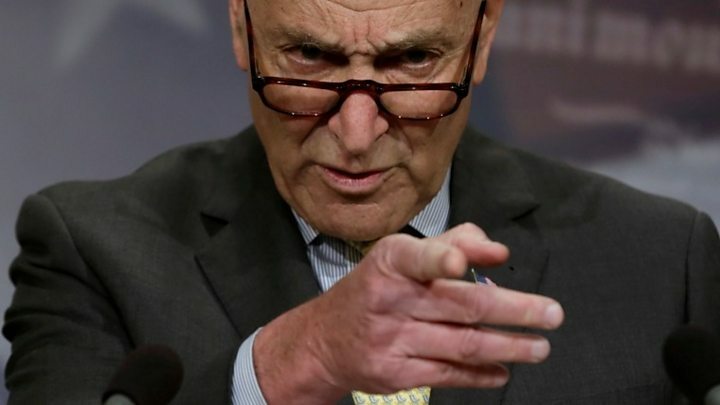 Media captionSenator Chuck Schumer: "Because the Department of Justice should be above reproach... [he] should resign"
Although some top Republicans in the House and Senate agreed Mr Sessions should recuse himself from the investigation, senior figures rallied behind him, resisting demands for the appointment of an independent prosecutor. For Mr Sessions to be charged with perjury, prosecutors would have to show that he not only made false statements, but knowingly and wilfully misled members of the committee about an indisputable fact. The Russian response was to echo Mr Trump's witch hunt accusation. Foreign Minister Sergei Lavrov said Mr Kislyak had simply met "representatives of the executive branch and parliamentarians, public figures, non-governmental organisations", a practice he said that "has never been questioned by anyone". He continued: "All this very much resembles a witch hunt, or the period of McCarthyism, which we thought had long passed in the United States as a civilised country." In the 1950s, Senator Joseph McCarthy oversaw an investigation into alleged communist activities in the US. Were there any other meetings with Russians? Well, Michael Flynn has already been fired from the post of national security adviser after he misled the White House about his conversations with Mr Kislyak, allegedly regarding US sanctions. It has emerged now that Mr Trump's son-in-law Jared Kushner was with Mr Flynn when they met Mr Kislyak in December - after the 8 November election. A White House official speaking on condition of anonymity confirmed this on Thursday. At the Republican National Convention in Cleveland in July, Mr Kislyak also met Carter Page, who briefly advised the Trump campaign, according to a source quoted by Associated Press.